Surfacing once again! I’ve been practicing my old weight loss regime. I still don’t recommend it. As I’ve been spending so much in time in bed, I’ve gotten a lot of soapstone carving done (not the major work, just the fine sanding). I finished J’s dolphin (he found the sanding boring) and my whale. I also re-sanded and polished all my old pieces. Soapstone is an incredibly soft stone – you could scratch it with your fingernail – which makes it ideal for amateurs to play at sculpture. Tor those who don’t know – and that is probably pretty much everyone – it works like this: first, you carve your shape, using a saw, then chisels and files. Once you have the shape, you take some rough sandpaper and sand away all the file marks, round corners nicely, etc. Then you take a finer grade of sandpaper and sand away all the marks made by the rougher stuff. Then you take some finer sandpaper than that and repeat the process, until you are down to sandpaper so fine you can hardly distinguish it from regular paper. Then you take that last sandpaper and cup of water, and sand the piece wet. Done properly, the piece will then have such a high sheen you don’t need to use any oils or polishes to darken it up, beyond rubbing it with you finders for a while. I love the polishing stage. I love all the stages, actually. Most of my family gets bored after a few levels of sanding, probably because when they think they are ready to move on a level and bring it to me for inspection, I say, “You missed a spot here, here, here and here, and this just isn’t smooth enough here.” They could just ignore me, of course, but then their piece wouldn’t end up so smooth. I have a particular eye for detail and the obsessive/compulsive perfectionist in me loves to work out every little scratch and mark, so eventually everyone just hands over their soapstone to me for completion. 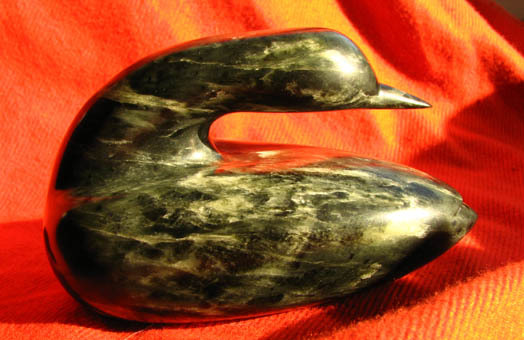 This is a loon I carved many years ago , which I have re-polished since I found sandpaper that was much finer than I had the previous time I worked on it. This shine is achieved with sandpaper and rubbing with my hands alone. No actual polish. Last weekend, J’s brother and family were in for Yom Kippur, and we took my three nephews to stay at our house. To keep them amused at one point, we pulled out the extra pieces of soapstone and got the three of them carving too. The nice thing about soapstone is that you don’t really need to be a great sculpter to make a nice piece. Once you polish it up, pretty much anything looks impressive. If it’s badly carved, it just looks more stylized. This one is a good example. I really don’t like how it turned out. I made a huge mistake in the whale’s tail (which you don’t get to see), but it still looks gorgeous now. It even has cool little flecks of gold in it. This one is J’s, which is a very stylized dolphin. It has even more cool flakes. I also watched Six Feet Under on the laptop. I never saw it on TV, but I have now gone through all five seasons in about a week and a half (I started before I got sick). It is pretty darn intense to watch a show like that in such a short period of time. It is almost like reading a book. Anyway, damn good show, if anyone else hasn’t seen it. It made me think, not just about the issues the show raised, but about the nature of television in general. They broke a lot of TV ‘rules,’ like clear-cut good guys and bad guys, and happy endings. I wanna carve stuff. Where do you get the soapstone and the tools? Hey, if you’re sick enough to go through another series try Firefly and then the movie Serenity afterwards, you wont regret it. Also Carnivale is really good too. I’ve never heard of either. I’ll check them out. But I need to wait a while or my poor suffering husband will kill me. The tools to carve are easy to get – any hardware store carries a variety of files and small chisels. The soapstone is tougher. In Canada, you can get it at Lee Valley Tools (www.leevalley.com). You can order it online from them too, but the postage is probably pretty painful, given how heavy the stuff is. Oooo I found a distributer. Stoneman. Cool…I think I might order I kit. Can you use soap stone for cups and stuff? I’m very impressed that you found someone so quickly. You can use soapstone for cups, but if you drop it, it will break and unless you finish it with some sort of serious polish or wax or something, it will scratch very easily. Because it is so soft, it does scratch *very* easily – like with your fingernail – so it will get seriously scratched up if you use it as a cup. Now, they make soapstone countertops, so there must be something out there that can be put on to protect it, but I have no idea about that. Also, the pieces of stone in those kits are pretty small and wouldn’t work for a useable cup. The kit might be a good starting point. Doesn’t seem to have chisels, though. Also, the pieces of sandpaper look too small. 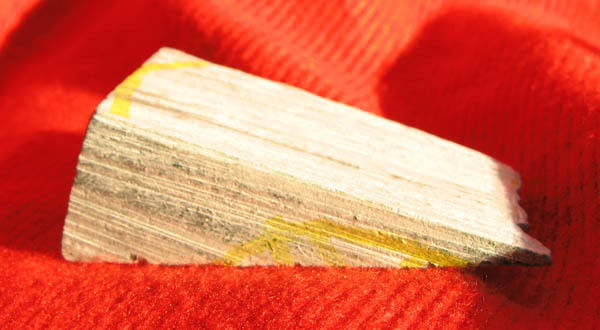 and if you want a high sheen, you’ll want 1000 grit and 1200 or 1500 grit as well. It is expensive, too. I got a block that is at least twice that size at Lee Valley for $18. Then we bought a file set for $10 and a set of small chisels for another $10. I also bought a few extra files, but that was because there were five of us at it, and we needed some duplicates. Sandpaper is cheap, so I’ve spent maybe another $5 on that. Comes out to a lot cheaper than the kit, even with postage for the stone. But if you get the bigger piece, you either commit to carving a big piece or you need some sort of saw to cut it up. We cut ours up into 5 pieces, then cut that last 5th into 3 smaller ones. My loon is out of one piece big piece, but I cut the corners of the block with a saw and then carved them into the little whale and a couple others I didn’t photograph. TMI? Or can I answer any more questions? Soapstone is seriously cool. Good ideas. We have a Lee Valley in Vancouver so next time I’m out that way I’ll get those tools. It sounds really relaxing to sand them and make it all shiny. Thanks for your info!! hey i was told by mi padre to stop carving drying clay and start carving soapstone… i work on large scale with small details… do you know of a place that would possably have 3′ by 2′ by 2′ or so pieces of soapstone for fairly cheap??? i’ve searched for about 3 hours in total to no prevail. Tim, it hasn’t occurred to me to sell them, but I if I keep churning the carvings out, I might have to. I’ll run out of room. I agree Six Feet Under is brilliant, loved Carnivale too. If you want something light that’ll make you laugh try Couplings. The use a harder grade soapstone for kitchen benches. 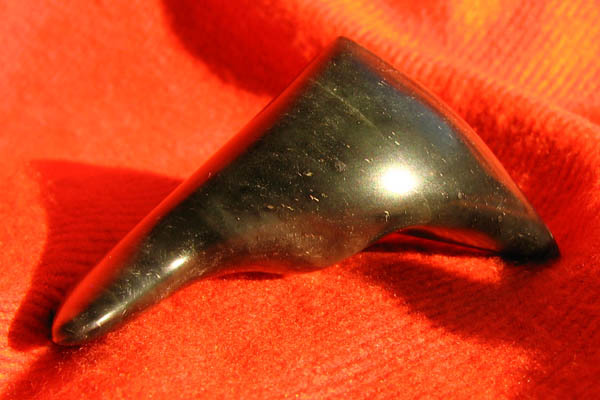 What do you polish soapstone with? 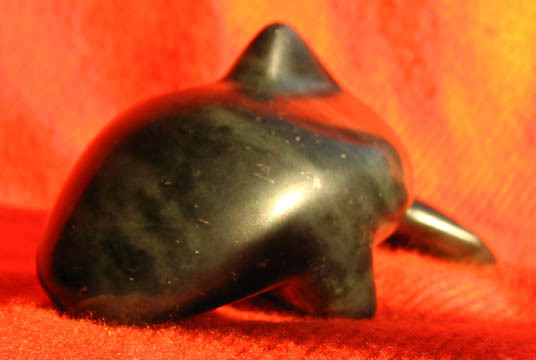 It might just be me… but I find it difficult to carve small details into soapstone. It’s more of a broad medium. I want it to come out as detailed as bronze. Is this a possibility? I’d probably have to try a stone less soft like marble.